I remember chuckling away to Channel 4’s ‘Very British Problems’ where this particular episode focused on the awkwardness of social greetings such as handshakes, not hearing, avoiding people and the long and awkward goodbye. Watch this clip. Have you ever done any of these? I got to thinking how some of our other little quirky habits stop us from being happy and feel confident. There are 3 of them and quite nicely they all begin with the letter C. Can you guess what they are? You will never be happy if you……. If you showered your child in dirty water, they would smell. Yup. Stay with me! If you went to the bin and dug out yesterday’s leftovers for dinner, you would probably be sick and hungry. Yup. If you put your new seedlings in rocky, dry soil, they wouldn’t bloom. With those analogies in mind, can you tell me why then that we spend a majority of our time thinking about what’s wrong, what’s missing, what annoys us and giving attention to our problems? Is it a British thing to moan about August rain and then when it gets hot moan about how we can’t sleep because the heat is driving us insane?! What you think about gets bigger so we have to focus our attention on what we want instead of what we fear or dislike. When it comes to parenting, we need to see the child as we know they can be. May I be as bold to say and stop projecting our fears onto our children or wanting for them what we want or wanted for ourselves. This is why I like to coach children ‘clean’ (without a parent’s summary of the issues or challenges). Usually, the child’s friendship issues or the child’s anxiety comes from parents. If you grew up as a child feeling unsafe, you are going to be overly cautious and unknowingly pass this fear onto your child. ‘Look at this mess!’ becomes ‘Let’s get tidying up so we can sit down and have a cuddle / make a snack / play another game. 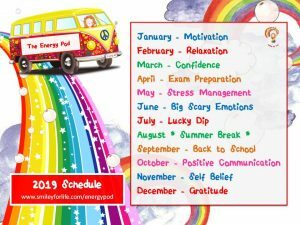 Think about how you want to guide your child to learn conflict resolution, how to tidy up after themselves or being punctual instead of projecting your fear that they are going to turn into a spoilt, messy and disrespectful human being. What you think is what you create. It’s also worth remembering that as we are all connected, your child often mirrors what you are thinking and feeling. Practise seeing the good and trusting that it will all work out the way it’s meant to. Most of the time we are unhappy it’s because we are feeling like we are not meeting an ideal or not doing what everybody else is doing. This is true especially when it comes to parenting. Do it your way. Follow your heart. It knows. You can only be the best version of who you are and you can nurture this in your child by allowing yourself to be messy and imperfect (as all humans are). Be a good enough parent. Don’t get hung up on perfection. You are setting the bar too high for yourself and for your child. Notice how far you have come over the weeks, months and years. Look at what changes you’ve overcome, how you’ve grown, what you’ve experienced. The rich tapestry of family life will mean there is so much good stuff in there. Know how to mop up when things go wrong. Make your apologies and put it right. Verbalise and role model making good skills. Draw a line under disagreements. Learn how to be a Good Enough Parent. If you have more than one child, then try and focus on their personal strengths. In ‘Siblings without Rivalry’ by Adele Faber and Elaine Mazlish, they talk about the perils of comparison. A child will feel like they constantly fall short if their perception is that they are not as good as their sibling at something. Or worse still as kind or as well behaved. The same authors also wrote ‘How to Talk So Kids Will Listen and How to Listen So Kids Will Talk’ which is one of my all time go-to books. It’s simple and has great results. Be the voice in your child’s head that is their cheerleader. The one full of gentle kindness and encouragement. When we are overly critical of ourselves, we are with our children. Who is the voice inside your head that gives you a hard time or nags you to try harder or shames you into feeling silly because it didn’t go as it should have done? Now there’s a word: should. When we use that word, we are making ourselves wrong. You can correct your child without harshly criticising. I often say what I see instead of starting sentences with ‘You’ as this feels accusatory. Say what you see! Do you speak to yourself as you would a friend? Do you find the good in your children when they are trying hard but get it wrong. I know it feels like they are testing you and pushing all your buttons. Take a step back and look at what has been triggered in you. It’s not personal. What is triggered in you is about YOUR journey to healing. So if we take these quirky little habits and bring them into our awareness. We can gently correct ourselves when we get into a space where we are complaining, comparing or criticising. Give it a go and day by day you will notice how good it feels. 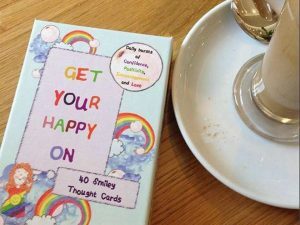 If you like what you’ve read here and you’d like a helping hand, you can buy a box of my Smiley Thought Cards – daily bursts of love, positivity, encouragement and confidence for all the family! Join in my little community and get your happy on. Families everywhere love them and I’m getting awesome feedback. Which one is your favourite?